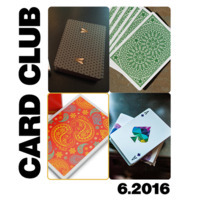 Today, when you order "Card Club: June 2016", you'll instantly be emailed a Penguin Magic gift certificate. You can spend it on anything you like at Penguin, just like cash. Just complete your order as normal, and within seconds you'll get an email with your gift certificate. New to card collecting? Wanting to build your collection? Or do you just want to expand your collection at an unbeatable price? In any situation, Card Club is a terrific choice for you! With so many new decks hitting the market these days, it can be hard to keep track of them all! When you join Penguin's Card Club, you won't have to! Each month you'll receive 4 of the top decks on the market, hand-selected for you by our resident card expert, Kevin Reylek. In addition to the latest and greatest decks, Kevin will also sometimes throw in a deck that you may have missed from years past but is totally worth your attention! You'll also see the decks in action with sweet flourishes from Dalton Wayne as well as other guest artists! Each month, you'll not only learn about each deck and what makes it unique, but we love to throw in extra bonuses such as videos or PDFs as well! Westminster: Designed by Phill Smith and produced by Penguin Magic, the Westminster deck is the ultimate collaboration between the US and England! The design is inspired by the gothic architecture of Westminster Abbey, with the backs printed in a gorgeous metallic green ink. The deck includes a custom Ace of Spades, Gargoyle Jokers with a built-in reveal trick, a duplicate card, and a specially-printed gaff! Westminster is printed by USPCC on high-quality Bicycle stock with premium finish for excellent handling. Black Honeybee: Back in black! Our best-selling Honeybee deck is back in a new Black edition. Everything you love about the original Honeybees is still here - beautiful design by Randy Butterfield, superb feel and longevity thanks to Bee stock and premium finish, plus the custom Ace of Spades, Jokers, and custom color/texture on the face cards. These borderless beauties are as much fun to use as they are to look at, and we've included 2 awesome gaffs for mind-blowing magic tricks. 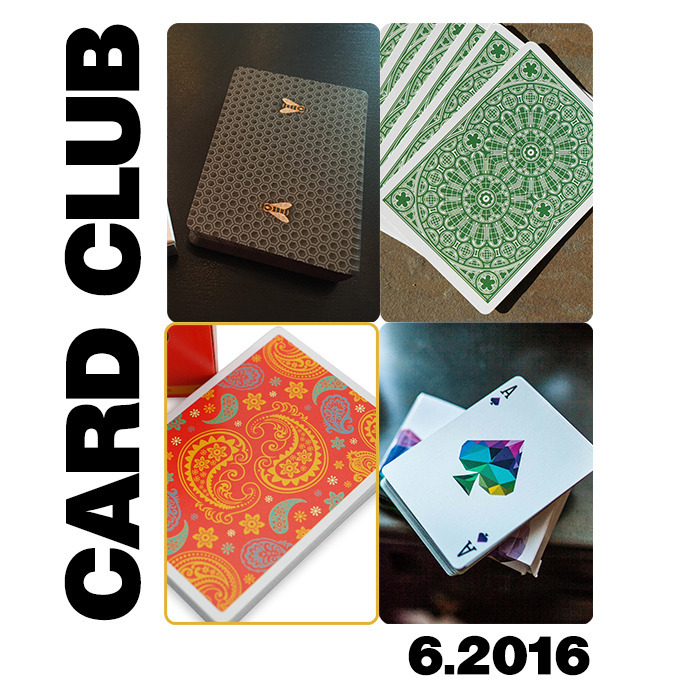 Only 2,500 will ever be made, and they're YOURS with Card Club! Dapper Deck (Orange): As the first signature deck from Vanishing Inc, the Dapper Deck is a fashion-forward deck of cards that is not just intended for collecting, but to be used! The tuck box has a spade-shaped die-cutout on the front, plus embossing for a premium look and feel. The cards themselves have an extensive amount of color on the front and back, and the cards are printed on a high-quality stock and finish. Memento Mori: Created by Chris Ramsay, the Memento Mori deck is an embodiment of the Latin phrase that means, "Remember your mortality". For centuries, people have carried a token as a reminder of our fleeting time on earth in order to make the most out of life since our only certainty is death. Designed in a multi-color, low-poly design featuring a colorful skull on a stark white background, the Memento Mori deck is unusual and stunning. Printed by USPCC on quality Bicycle stock and premium finish, the Memento Mori will be a jewel in your collection. This was my first month subscribing to the card club after being a loyal subscriber of Penguin Live and the Tarbell series. I'm a bit of a card hoarder so finally gave in to a subscription and what a month to start. Four fantastic decks. In fact I'd already put in an order for two of the decks prior to this month's decks being announced. I'm not disappointed though because these are all great cards. The accompanying video covering the decks just makes it though. I love the thought and detail that goes into it. My only very minor criticism though, is that I purchased the Westminster cards seperately from card club which came with a nice video explaining the jokers with an example routine. It doesn't look like you get this with CC. Seriously... Skip starbucks for a week and get 4 cool decks in the mail. Each of these decks are beautiful. I can't find anything negative to say about card club. Definitely subscribe to this. You will not be disappointed. I was skeptical at first, but I don't think I'll ever unsubscribe.